Maybe Don Cheadle, Chris Evans, and Scarlett Johansson look surprised cause they just got new script pages. How far does Marvel go to keep the secrets for a film like Avengers: Infinity War? Most of the actors never get to read the entire script. 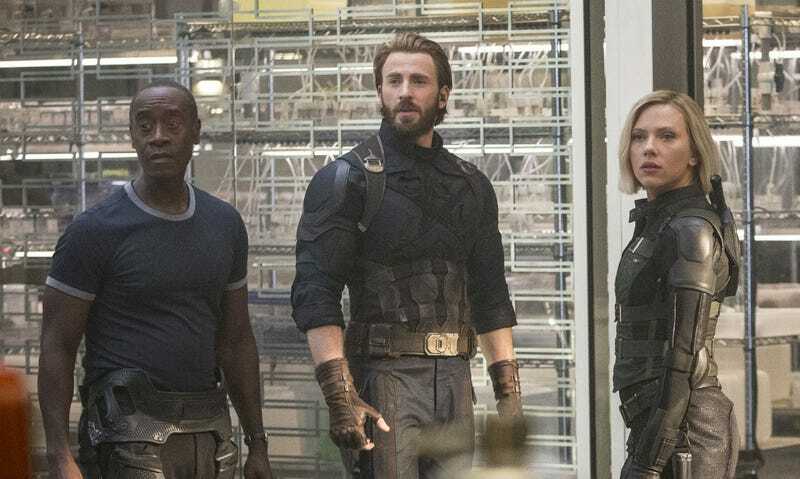 Obviously, they see the scenes they’re in, but otherwise, directors Anthony and Joe Russo—along with the writers, Christopher Markus and Stephen McFeely—tell the actors the general story and character motivations, and that’s it. It sounds like a horrible situation for an actor but, when a group of journalists asked veteran actor Don Cheadle, who plays James “Rhodey” Rhodes (pilot of the War Machine armor), about it on set last June, he was actually happy not knowing. When Cheadle said this, it was his first day working on the movie, filming a scene where he and several other Avengers land in Wakanda. So he still had those few notes he had been given fresh in his head. After being accidentally but near-fatally injured by the Vision in Captain America: Civil War, War Machine and the android have buried the hatchet, according to Cheadle, and Rhodey has long gotten used to the high-tech leg braces his friend Tony Stark built for him. However, whether Rhodey will survive the battle with Thanos is something not even Cheadle knew, of course. Read more from our visit to the Avengers: Infinity War set below. The film opens April 27. More Infinity War, Hey That Rhymes!